Not too long ago, I had the chance to interview the former big cheese of the EU, Jose Manuel Barroso, for a political magazine and journal Open Citizenship. One of the more surprising parts of the interview is where he spoke about democracy in Europe, particularly the rise of populist movements. He seemed to make the claim that all populist movements across Europe sprung from a common nationalist, source. 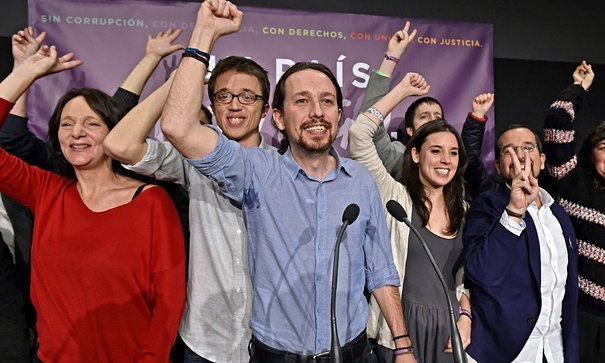 Podemos, in his calculus, was no different from Front Nationale or UKIP. There is a point, and perhaps there is a deeper truth argued somewhere by social scientists, but the argument fails in one major regard: the preservation of a local society against globalizing forces does not necessarily have to be nationalist. UKIP and Front Nationale, like Podemos, are concerned with the welfare of their national populations, but they frame this concern in a nationalist, xenophobic and racist way. Podemos and left-wing movements frame their concern in an ineternationalist way; one which champions solidarity and social welfare. Obviously left-wingers can be racist xenophobes. But the idea that the rise of populism across Europe is homogenous and even – the idea that Europe is becoming more and more racist is not true. It’s not untrue either – it’s incomplete. Europe is certainly experiencing a rise in anti-immigrant sentiment, but it is also opening pockets of internationalist, left-wing resistance which are making real electoral gains as Podemos did last Sunday, and are welcoming refugees and immigrants from across the world. It’s important to remind ourselves of this when we give in to thinking that we’re a doomed continent – or worse, solidarity is a doomed feeling. Coke, Mexico, ISIS and other things. Will everyone please just chill?